For the second time in 2012, Capcom is going to be porting one of its popular console-based fighting games to the small-yet-lovely HD touch screen of Sony’s PlayStation Vita. First it was Ultimate Marvel Vs. Capcom 3, a launch title port of 2011’s mash-up beatdown simulator. 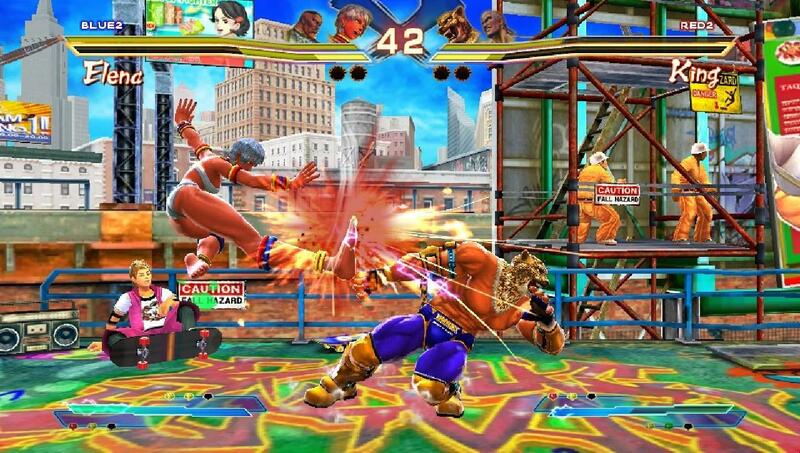 Next up, for a fall 2012 release, is Street Fighter X Tekken, which came to PlayStation 3 and Xbox 360 consoles in March. The Vita version of the game is more than just a straight port, of course; in addition to there being new characters and cross-platform play with PS3 version of the game there are also a few Vita-specific features that feel like an evolution of what was attempted, but didn’t quite work, with UMvC3. Let’s not go overboard though. To be clear, this is still Street Fighter X Tekken. It’s the same game that Capcom released earlier this year, for all intents and purposes. There are 12 new fighters in all, six apiece culled from the Street Fighter and Tekken universes: Sakura, Blanka, Guy, Cody, Elena, and Dudly on the SF side and Lars, Alisa, Bryan, Jack-X, Christie, and Lei on the Tekken side. If you buy the Vita version of the game and you already own the PS3 version, then you’ll also be able to access those new fighters on the console side using a packed in DLC code. The same fighters will also be available to PS3 players without the Vita release at a cost of $20 for the pack. While I didn’t get to see the cross-platform faceoffs in action at a recent Sony preview event in New York City, I did have an opportunity to sample the Vita game in a local Ad Hoc versus match. Street Fighter X Tekken will support local wireless match-ups as well as online play over both Wi-Fi and 3G connections. The 3G online play is a first for the Vita, with most games so far using that feature more to take advantage of the content sharing offered by Near. SFxT for Vita will use that as well, and it’ll include some as-yet-unrevealed AR functionality, but being able to actually play a game over your 3G connection is a big step forward for the little handheld. In terms of the gameplay, the controls are pretty much a micro-sized version of what you’ve seen in the console release. There’s really no mystery here. I’m told that some of the more active backgrounds are toned down a bit in the portable release, but the gameplay looks, moves, and feels pretty much exactly as it does on the console. There are some nice bells and whistles added in, like the ability to select your paired fighting team using the touch screen, but there’s no great evolution here, nor does there need to be. The only major wrinkle is the addition of entirely optional touch-based fighting controls. The Vita version of UMvC3 made an attempt at this, but it didn’t really work out. You could dominate pretty much any fight in that game by simply tapping the screen, with very little nuance or complexity. SFxT on Vita takes a slightly different approach, dividing the screen up into four invisible quadrants, with each quadrant filling the same role that one of the four face button attacks normally would. So instead of using the buttons to perform attacks and combos, you have the option of simply tapping the screen. It’s definitely a gimmicky thing, but it’s much more well thought out than what we saw in UMvC3. That pretty well sums up where the Vita version of Street Fighter X Tekken is. It’s a port, but certainly not a half-assed one. The touch controls probably won’t move any copies on their own, but the cross-platform feature and option of playing over 3G connections in addition to Wi-Fi and Ad Hoc certainly will. Capcom still has more to reveal about the game as well, additional modes and features that we haven’t heard about yet. As it stands even now though, Street Fighter X Tekken looks and feels like it’s going to fill the portable fix that fans of the series no doubt crave.